Smartphone on wheels. That's the sales pitch for the new limited edition Vauxhall Adam White. Does it deliver or even make any sense? Here's one way to look at it. The idea that there are no bad cars any longer is a familiar refrain that reflects the increasing dynamic similarity between modern cars. Nobody really makes sheddy cars these days. But one area where there is plenty to choose from is in-car technology. There are some hugely dramatic contrasts in quality between the various multimedia systems – much more so than in engines or handling. What's more, car-buying punters have ever higher expectations of technology in general. Everyone's a smartphone expert nowadays. Anyway, in that context the whole smartphone-on-wheels pitch actually makes a lot of sense. And for the Vauxhall Adam that translates into the Intellilink multimedia system. The basics involve media playback, app support and connectivity. There's audio playback via USB, Bluetooth and DAB radio. You get full hands-free telephony, too, obviously. Where things get interesting is Intellilink's app functionality. Currently, that's a little limited. You've a choice of just two internet radio apps and one nav app. The streaming audio apps are TuneIn Radio and Stitcher while the nav functionality takes the form of BringGo. As the system is currently designed, you'll actually have to visit your local dealer to add any apps which appear in future. That said, for now the apps work well. You'll need to connect a smartphone to enable them. Both Android and Apple iOS devices are supported, though oddly iPhones must connect via USB while Android handsets must sync via Bluetooth. Either way, you're presented with a good-quality interface on the Adam's seven-inch central touchscreen. In terms of response, the resistive-touch screen isn't as slick as your smartphone's capacitive screen, but it's functional enough. Oh, and for iPhone users there's also fully integrated Siri support via steering wheel controls. In other words, any functionality that doesn't require that you look at your iPhone's screen can be controlled via Siri is available. So you can set new appointments, have emails and texts read out to you, compose the same. Exactly how useful you'll find this will depend on how much you already use Siri. But in our experience, the voice recognition accuracy while using Siri in the Adam is pretty comparable to using it directly on the handset. So far, so good. While the app functionality is limited, the streaming audio works well and the nav app has the advantage of being internet connected and thus offering high-def real-time traffic, a service that's miles better than the brain-dead RDS-TMC traffic data that most built-in nav systems make do with. However, there is one conspicuous downside to bringing the app model into cars, and that's premium pricing. Not for the system itself. Intellilink comes as standard with the Vauxhall Adam White. Instead, we're talking about app pricing. You can try the BringGo nav app for 69p in the UK for 30 days. After that, you'll need to stump up £37.99 for full nav functionality or £54.99 for nav with traffic data and map updates. On the one hand, this is very cheap compared to the prices charged to add nav to most cars. And it's worth noting this is buying you the BringGo app on your handset that you can then use anywhere, not just in the Adam. On the other, when you've just paid £14,995 for the Adam itself, you might feel like they could have chucked a £50 app into the bargain. In the end, a car isn't a smartphone and that's always going to create some tension when it comes to notions of pricing and value. As for what the rest of the Adam White is like, it's mostly good news. It's a great handling little car and thus bags of fun to punt about. It's grippy and responsive while also feeling very solid and grown up. The best of both worlds, then, and a surprisingly decent long-distance cruiser. If there is a dynamic downside, it's the engine. The 1.4-litre petrol lump is pretty coarse and delivers mediocre performance. It's really the only significant weak link in the overall package. 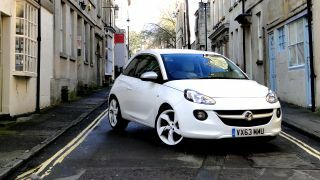 Overall, we like the work Vauxhall has done with the Adam and Intellilink. Is it the best multimedia system in this part of the car market? No. MINI Connected is clearly superior. If you want a hatchback with the best possible infotainment, that will be a MINI, albeit in a car that's a size up from the Adam and more expensive. And what about Apple CarPlay? It's also worth noting that what works well now may seem very old hat once car's with support for Apple's CarPlay interface begin to appear. Things are changing awfully fast when it comes to in-car tech and it's not yet clear whether built-in systems with app support like Intellilink or mobile-OS mirroring a la CarPlay are the future. However, Intellilink is still a nice system that offers most of the key functionality we want for little to no outlay and thanks to Siri support is a particularly good proposition for iPhone owners.